Is there a future for UFC star Conor McGregor in the NFL? McGregor showed off his arm before the Dallas Cowboys' 40-7 win over the Jacksonville Jaguars on Sunday. 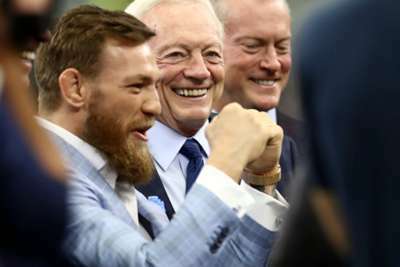 A guest of Cowboys owner Jerry Jones, McGregor – who lost to Khabib Nurmagomedov at UFC 229 in Las Vegas – threw a pass during the warm-up. McGregor's throw was mercilessly mocked on social media but the Irishman's attendance at AT&T Stadium was appreciated by the players, including Cowboys quarterback Dak Prescott. Prescott imitated McGregor's signature strut after his 17-yard touchdown in the first quarter. "We watched the fight a couple of weeks ago, so a bunch of us are fans," Prescott said. "To see the guy supporting us or here marketing for himself or whatever it was, we used it to our advantage. It was good to see that and all the guys have fun."